The 18th century was a wealth of knowledge, exploration and rapidly growing technology and expanding record-keeping made possible by advances in the printing press. In its determination to preserve the century of revolution, Gale initiated a revolution of its own: digitization of epic proportions to preserve these invaluable works in the largest archive of its kind. Now for the first time these high-quality digital copies of original 18th century manuscripts are available in print, making them highly accessible to libraries, undergraduate students, and independent scholars.Delve into what it was like to live during the eighteenth century by reading the first-hand accounts of everyday people, including city dwellers and farmers, businessmen and bankers, artisans and merchants, artists and their patrons, politicians and their constituents. 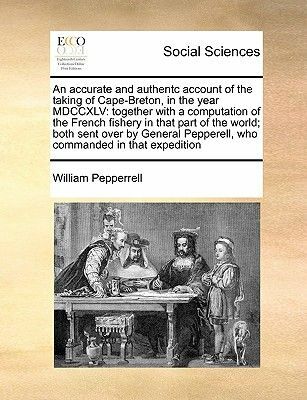 Original texts make the American, French, and Industrial revolutions vividly contemporary.++++The below data was compiled from various identification fields in the bibliographic record of this title. This data is provided as an additional tool in helping to insure edition identification: ++++British LibraryT145099Originally published with the title: 'An accurate journal and account of the proceedings of the New-England land-forces, during the late expedition against the French settlement on Cape Breton', Exeter, 1746.London: printed for J. Staples, and T. Atkinson, at York, 1758.! 2],41,! 1]p.; 8.